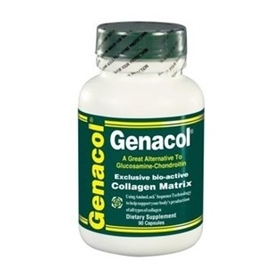 Genacol is a molecular-enhanced Bio-Active Collagen Complex complex formula which contains crucial structural porteins that our body requires to repair and rejuvenate itself; structural proteins not found in Glucosamine/Chondroitin. By using the complete collagen molecule in Genacol, you get 100% of the protein chain required to help restore joint mobility and reduce overall pain and joint discomfort. Collagen is the fibrous structural protein that makes up the white fibers (collagenous fibers) of skin, tendon, bone, cartilage, and all other connective tissues. It is also found dispersed in gels of the body to provide stiffening, such as in the vitreous humour of the eye. Collagen is the natural protein that composes most of the body’s structural support and is the primary substance of connective tissue. Collagen is part of the natural make-up of tendons, ligaments, joints, muscles, hair, skin, and vital organs. When the body’s essential supply of collagen is reduced, the body is affected. Weakness, fatigue, aches, pains, and an overall lack of performance are frequent symptoms of the problem – symptoms that increase as we get older. Besides its many structural properties, collagen serves as the major catalyst for growth and repair of nearly all the body’s tissues. The body's production of collagen diminishes dramatically with aging. Collagen production begins to slow somewhat in our mid-twenties, decreasing more in our thirties and forties, then throughout our fifties and sixties, collagen production slows to a crawl. We may first notice it on the outside of our bodies, as tiny lines and wrinkles appear. By that time, the lack of collagen production is already affecting the inside of our bodies. Collagen damage gets our attention as strains and sprains become more severe. Things we have always done, like walking, running or jumping, may suddenly seem more painful. Injuries that have never proven serious before begin to hurt a lot more. Joint pain becomes more problematic. These are all signs that a collagen supplement could be very beneficial. Is a safe, natural ingredient that's recommended by doctors world-wide. Daily use of Genacol has been shown to reduce pain in joints from injury, strain or collagen deficiency related diseases such as arthritis, osteoarthritis and bursitis, and other degenerative diseases such as carpal tunnel syndrome and tendonitis. Two conditions that show the greatest response to a collagen supplement are rheumatoid arthritis and osteoarthritis. If you experience any of the symptoms associated with these conditions, Genacol will help. If you lack mobility in your hands, arms, shoulders, hips, knees or other joints, or if you experience joint pain or inflammation, then Genacol is for you. There are no side effects associated with Genacol (though it is recommended children under 12, pregnant and lactating women not use Genacol or other collagen products). "I have used collagen as a supplement for 3 years. I am very happy with Genacol. I can't stop myself from talking about collagen. I like Genacol more, because of its purity. I also like capsules versus liquid form." "I had an ankle injury that I'd had for probably 6 monthS. I Knew GENACOL was doing something really good. So I'm very happy with Genacol." "The collagen facial is wonderful. I can feel it plump up my skin. My skin has a tendency to be very dry. This product makes it dewy. Not oily, but it has a dewy complexion. When I used the Genacol Facial, the results were immediate. And of course upon applying makeup, it was very smooth. People noticed that my skin looked much better." "When I started using the Genacol Facial System, I started seeing results immediately. Within about 3 days, I noticed these fine lines around my mouth were softening up. I think it's a wonderful product!" "I am a skin therapist and have been in the salon and spa business for the past 20 years. I have used a wide variety of masques on my clients but I have to say that the Genacol Collagen Facial System is by far the most unique and effective system that I have ever used. The first time I used the Genacol Collagen Facial System, I couldn't believe the results I experienced. My husband, friends, and neighbors noticed how great my skin looked after just one treatment. My skin got firm, especially around my "laugh lines." I experienced toning around my eyes, my face was more vibrant, and it helped remove the 'tired' look. It has done wonders for my skin. I feel 10 years younger! I have now incorporated the Genacol Collagen Facial System into my skin care business and my clients love it! As a woman and a skin care professional, I wanted to tell you that this is the best collagen facial masque product I have ever used. I believe that I have found a 'Fountain of Youth' in the Genacol Collagen Facial System. Thank you!" Amino acids are molecules that form protein. Proteins are digested by the enzymes in the digestive tract turning them into amino acids. Genacol® is a collagen-based amino acid complex. Amino acids are fundamental nutrients that are indispensable to the organism: components of protein, irreplaceable structural agents for muscles, chromosomes neurotransmitters, antibodies, sensory receptors and certain hormones. The body has a continual need for amino acids to create 2.5 million red blood cells every second to replace the blood platelets and the enterocytes (intestinal cells), and every 8 to 10 days to renew most of the leucocytes etc... In other words, protein synthesis is incessant, therefore our requirements for amino acids must be sufficient, especially the essential amino acids. To maximize the absorption of protein and amino acids we need to favour the antioxidants and zinc in our food or by supplementation. Protein is constituted by a chain of amino acids. During digestion and with the action of certain specific enzymes, this chain is divided, liberating the amino acids. It is necessary that the body has all the essential amino acids to synthesise its own protein. There are 20 amino acids that compose protein. Certain amino acids can be fabricated in the body, but others must be provided by food. These are called essential amino acids. This is where a nutritional supplement of collagen like Genacol® can help maintain healthy joints*. Where do the amino acids found in Genacol® come from? Genacol® is made of proteins that are taken from subcutaneous bovine source and are hydrolyzed, (purified with our unique enzymatic process). Then, Genacol International Corp Inc., concentrates certain fragments of the amino acids which have undergone strict analyses confirming that the product is completely safe and secure. The raw product comes from Brazil where no BSE (mad cow disease) has ever been reported. The product is certified by Health Canada, among others, so that Genacol® meets the highest neutraceutical standards. Genacol® is the best we can make because our employees and our family members take it! The Genacol Group continuously focuses on medical research to demonstrate the beneficial health effects of its products. Two independent studies have scientifically confirmed that Genacol® Original Formula helps maintain healthy joints*. The first trial, carried out at the University of Liège, Belgium, by Dr. Olivier Bruyère from the Department of Public Health, Epidemiology and Health Economics titled ‘‘Effect of collagen hydrolysate: A 6 month randomized, double-blind, placebo controlled study’’ was published in 2012 in the journal Complementary Therapies in Medicine. The second trial, carried out at the Veterans Memorial Medical Center, Philippine, by Maria Lourdes R. Bernardo and Alfredo C. Azarcon, Jr., from the Department of Rehabilitation Medicine. titled “A randomized Controlled Trial on the Effect of Oral Collagen“ was published in Volume 4, Number 1 January 2012 in the Parm Proceedings, official publication of the Philippine Academy of Rehabilitation Medicine. Both trials demonstrated that Genacol® Original Formula provides key nutrients that are clearly beneficial for joint health. This confirms the results of several other studies on hydrolyzed collagen carried out in the past. However, such studies had to use up to 10 grams of hydrolyzed collagen per day as compared to the 1.2 grams of Genacol®. Therefore, Genacol® hydrolyzed collagen proves to be one of the most promising nutritional products for joint health*. I had to quit playing sports, but after 4 weeks on genacol I am back baby!